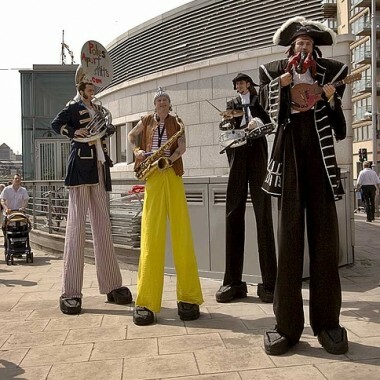 Poles Apart, fun group of stiltwalking musicians with many costumes and themed repertoires. Great for festivals and corporates, can be from 1 to 7 piece line-up. 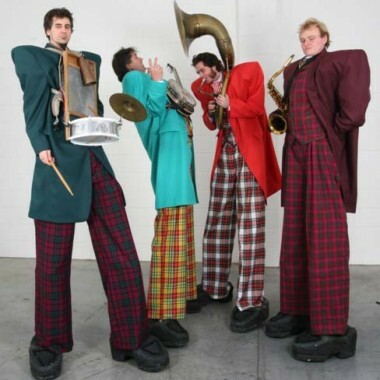 Poles Apart Stilt Company specialises in music on stilts, with a wide range of acts from different genres of music. We have brain-washed some of the most refined musicians to put their skills to performing at a higher level. All the costumes are created by the company itself in the dark catacombs of their subterranean workshops. 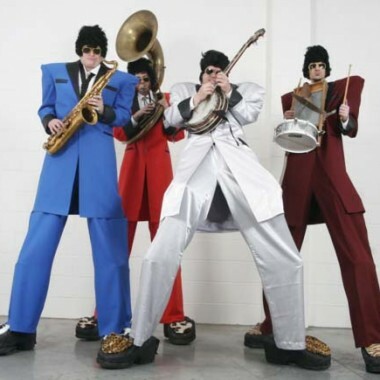 We have strutted our long-legged stuff across a vast array of arenas and venues, included such as Glastonbury, The Millennium Dome, Canary Wharf, Wembley Stadium and a long list of local festivals and private functions. 1920s Jazzers – Heavenly syncopation to those old-time favourites, such as ‘The Charleston’, ‘Love is the Sweetest Thing’ and ‘Spread a Little Happiness’. 1 – 7 piece consisting of a combination of sousaphone, banjo/accordion, trumpet, trombone, sax etc. Medieval Minstrels – A touch of the rack hath expandeth these musicians to their towering height, from whence they play upon shawms, bagpipes, sackbut, drums, cittern etc. Punch & Judy (and protagonist) – Will the baby survive another of Punch’s administrations and will Judy ever save the sausages? 1 – 5 performers including devil, policeman and doctor. Music band as well. Victorian Spectres Brass Quartet – Recently risen from the grave, these undead ghouls are cursed to forever perform for the living; whether it be jaunty tunes from the Music Hall, carols fit for a Dickens’ Christmas or even their calling card Chopin’s ‘Funeral March’. Brass quartet of a combination of sousaphone, trombone, trumpet and horn. Sgt Salt’s 9th Foote – Similar in musical material to the 1920s jazz band but using costumes of a Sgt Pepper style. Scurvy Sea Dogs – Created for Maritime festivals; a music band playing sea-shanties and the like. Join blind Pew, Long John Silver (stilt peg leg) and other characters in a rousing chorus. Various instrumentation. 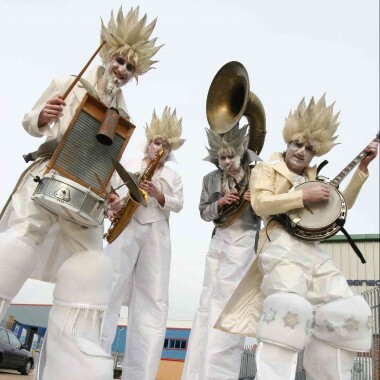 Bollo’s Hobo Clown Band – These colourful assorted Hobos bring all the fun of the Big Top with their ‘circus-screamers’ and lively marches. Brass ensemble. 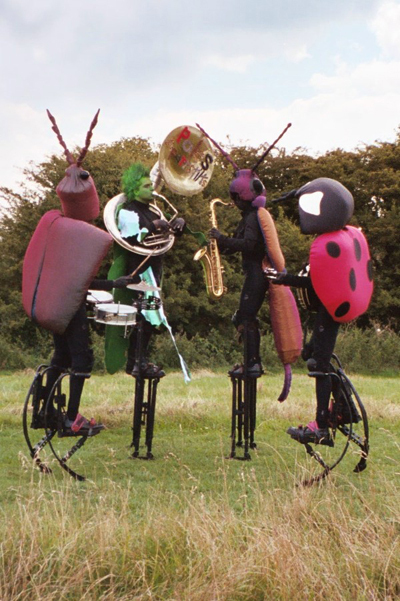 Other stilt characters – We also have Italian waiters (mandolin and accordion/banjo), devils, Policemen, insects, explorers, Jack Frosts, Santa and his helpers, Elvises, toffs…the list is extensive and they are pleased to consider making other characters and costumes for events. We also have the option for all the acts to perform as more lowly entertainers and also offer a fun dance band called The Iron Boot Scrapers. The group use small, portable crate amps which make them highly mobile and have adapted granny trolleys so that they can move equipment round at will.